Wintertime on the Kuskulana Glacier. 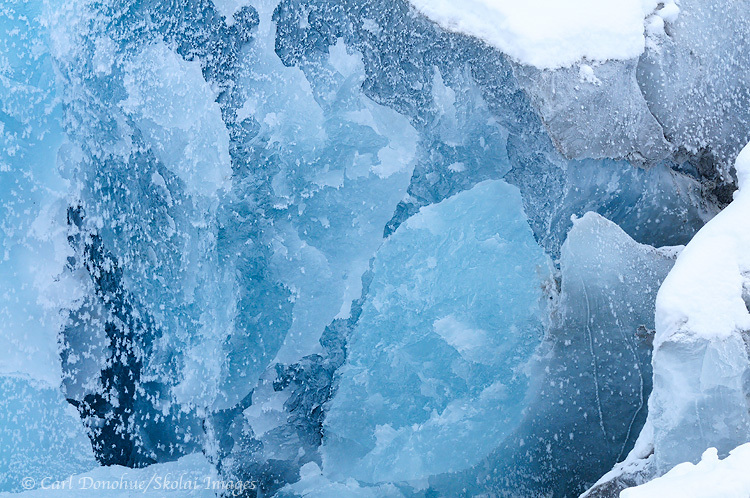 Abstract photo of ice patterns and colors on the glacier, Wrangell Mountains, Wrangell - St. Elias National Park and Preserve, Alaska. Please click on the image to view a larger version of the photo. It’s interesting to think about how technology and cultural constructs shape what we think and feel. Today we live in a somewhat bizarre world, where digital mediums both record and present way too much of our lives; we can watch Australia’s then Prime Ministerial candidate Kevin Rudd (he went on to win the election) pick something from his ear and eat it during gov’t Question Time, we watch a person rush over and catch a baby falling off an escalator, etc, etc. So much of our lives is recorded and witnessed again, from the mundane to the exciting, the thrilling to the disheartening, our greatest moments and our worst. Whether recorded intentionally or unintentionally, today we see it almost all on the big screen. In some ways, the power of visual imagery has only increased, it appears, with the inundation of imagery that digital technology has yielded. Some folks might suggest that this flood of images waters down its potency, but it appears to only strengthen with increased volume. The more imagery we’re subjected to, the stronger, apparently, their hold on us. We see virtually everything, and I wonder if that doesn’t blind us in some ways. Must we see it to believe it? Do our real world lives hinge so completely on recordings for us to understand beauty and grandeur, love or tragedy, death or finality? How about to gain closure? Has the evolution of an omnipresent recorded-visual imagery so reduced our ability to accept that we can’t trust that which we don’t see? I can’t help but think of how many amazing moments, from the monumental to the incidental, were never recorded on film, were never photographed, yet their stories told and retold over the years, nurtured for decades, for centuries. What’s lost to live in a world where if we must see it to believe it? Has “Reality TV” so molded our perspective that this is the only window through which we as a culture can move forward? Is that what we’ve become, that we’ve reduced even the most tragic and compelling moments of our lives to recorded imagery, to photos, to videos, to scripts? Are we THAT addicted to visual imagery that we need it for resolution? Life isn’t a reality show and nor was what happened Sunday, May 01, 2011. We’re not spectators on the sidelines of the universe; we’re participants of the world. Photos are wonderful things, and they can be an incredibly powerful too for the human mind, but the universe, and that includes our selves, rarely needs a memory card and a LCD monitor to move forward. Thinking further, I’m not sure this speaks to the power of an image, or power of imagery, as much as a debilitation of our other faculties. We all know that a completely passable ‘image’ can be constructed by even a relatively poorly skilled graphic artist, yet we’re somehow beholden to this idea of an image as documentation. We feel a need to “see it to believe it”, but we also know that seeing it doesn’t make it any more real. Few among us have the discerning eye to spot a good photoshop fake from an authentic photo, and yet we clamor for this pseudo ‘proof’; proof which will still, ultimately, rely on the word of some specialist we in turn seek for advice. “Is it real?”, would be the immediate response. We all KNOW this, yet still we have some weird kind of autonomic response, demanding visual measurement. I suspect what we’re experiencing is more likely an addiction to entertainment than a real strengthening of the power of an image. The phrase “the power of an image” has, in this sense, more to do with our own yearning to see than any heightened powers of persuasion a specific image might have. A picture might paint a thousand words, but if those words are merely ‘well, is this real?’ then I’m not so sure that’s a very powerful statement at all, is it? This entry was posted in Abstract Photos, Alaska, Landscapes, Musings, News, Photography, Winter, Wrangell - St. Elias National Park and tagged technology on May 6, 2011 by Carl D.